President Reuven Rivlin awarded an Honorary Doctorate, delivers keynote address at Hebrew University Convocation ceremony. President Reuven Rivlin on Sunday was awarded an Honorary Doctorate from Hebrew University at a convocation ceremony held at the University’s Mt. Scopus campus in Jerusalem. 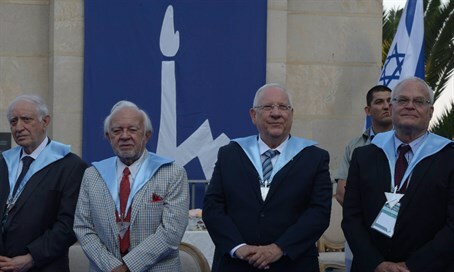 Rivlin addressed the audience, which included 277 students who were awarded Doctor of Philosophy degrees, of the importance of academia in bringing together the different communities in Israel. “Within a polarized Israeli society, with separate education systems, academia is the educational place whereby first meetings occur between the four Israeli tribes; secular, ultra-Orthodox, religious, Arab. This is the reason why academia has such an essential role in shaping the future of Israeli society,” said President Rivlin. “A national ethical vision, a public consciousness to serve, striving to realize the public interest, and above all an internal and public truth; these are the conditions without which the public may lose confidence not only in its elected officials, but in democracy itself. The public trust is our truth, and it is to them that we must be devoted,” he concluded.